Shifting Skin is a series of artworks featuring 3D augmented reality over high quality photographic prints of human skin marked by tattoos. This work was made in the course of my creative practice research as a member of the Deakin Motion.Lab. Development was guided by a consideration of surface in digital photography. My previous work has tested the representation of interior space in digital images. Having reached something of a conclusion in this line of investigation in Cavity—a series of stitched panoramas of the interiors of caves with an overlay of inhabitation—I realised that space and surface were co-creative: space is defined by surface. Prompted by an invitation to make work on the subject of queer beards, I was experimenting with the possibilities of scanography to reveal forensic details in skin—pores and hairs, scars and tattoos. While meditating on surface as a creative constraint, I realised that skin is a primary surface, the site of subjectivity, the border at which we perceive and are perceived. I wanted to set up a dialogue on the collapsing boundaries between material and virtual via the connecting metaphor of skin. 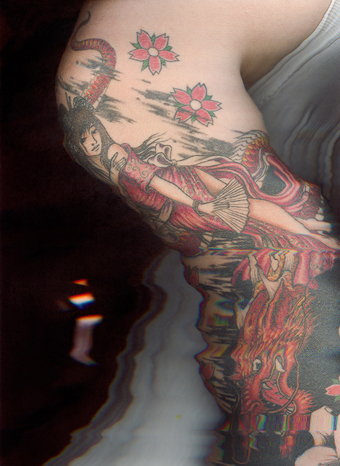 As an image, skin embodies many of the paradoxes of materiality and immaterial embodiment within digital culture. Indeed, there is also an emerging tendency to conflate the biological metaphor of skin with the surface of digital media, and the metaphors of the digital interface with biological skin. I am a digital native. My father was a computer scientist in the 60s and I grew up with a computer in the house in the days before there was a tangible difference between a PC and a Mac. Digital images make sense to me and I am endlessly fascinated by the cultural and psycho-social implications of digital technologies. There has been a profound shift in our engagement with what has been termed 'cyberspace' from an alternative virtual reality to an overlay embedded in the everyday and the physical. 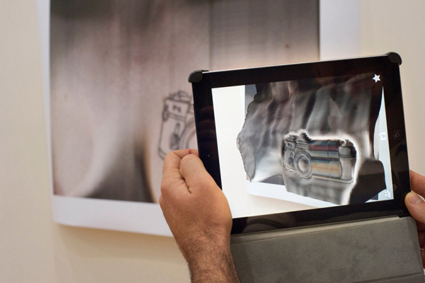 Augmented reality is not only emerging as a media technology but as a potential conceptual model to describe the contemporary dynamic between the so-called physical and digital. The digital is overlaid and embedded, not a virtual alternative. There’s a lot of ink around today. Sometimes I imagine a future in which so many generations have been tattooed that there’s a Darwinian glitch and babies come out of the womb pre-decorated. This of course would be a disaster as it undermines the very spirit of getting a tattoo—the agency involved in choosing your own new skin. Alison Bennett’s Shifting Skin depicts a number of lovingly chosen body decorations but rather than photographing them she has scanned them, using a modified flatbed scanner. 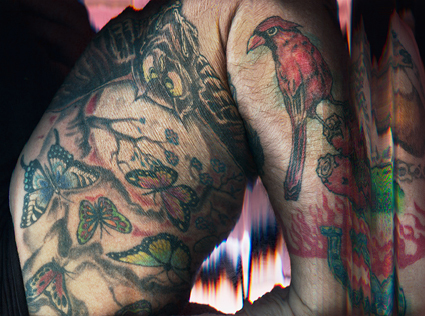 Studying someone else’s tattoo can be intimate at the best of times and Bennett’s scanning method, along with the scale of her images, makes it even more so, highlighting the skin’s scars, flaws, puckers and gaping hair follicles. The unaugmented images are fascinating in themselves as they bear glitches—rifts, pleats and curious ruptures of full spectrum rainbow colours. (Bennett admits that some of these interruptions are the happy accidents caused by scanner malfunction.) It’s often hard to ascertain where on the body these tattoos might appear as they are seemingly peeled off and flattened, depicted floating in a black space. This disembodiment becomes total when the images are viewed using a tablet or smart phone sporting Aurasma, an augmented reality app. Pointing the device’s camera at one of the images, the flatness begins to buckle and fold developing hills and valleys, sharp cliff edges and chasms—a contour map of the skin. Bennett avoids any literalising of the images. Rather than simply transforming the flat illustration into a three dimensional version of itself, she disrupts the tattooed image with extraneous lumps and bulges that don’t so much complement the image as mutate it into something else altogether. Bennett applies subtly different treatments to each image. Untitled (dragon) depicts a bold and colourful image of a dragon and an Asian girl. When augmented the blackness seems to extend infinitely backwards into deep space and shafts of what could be stars shoot out towards you, while the dragon and girl seem to float, writhing together in this new universe. Untitled (mother) is quite a simple tattoo, just the outline of an iconic 1950s housewife, but Bennet has augmented this with a range of swellings that from some angles seem to imply an even larger womanly shape—an über frau swallowing up the smaller. With Untitled (birds & butterflies) the skin becomes a garden with hillocks and secret caverns. These shapes are reminiscent of the alarming hyperreal mutations of Patricia Piccinini’s lumpen creatures though Bennett’s are perhaps more disturbing for the visceral “skin-ness” that she maintains in the morphing process.